As per the recent IDC report on Indian smartphone & feature phone market share for Q4 2016, no Indian smartphone vendor is in the top 5 list, and Chinese mobile vendors completely dominate the smartphone market share. Though India registered 109.1 million units of smartphone shipments for the year 2016, there was a drop of 20.3% in Q4 2016 comparing to the previous quarter. Due to the festival month & the demonetization effect in November, the smartphone shipments in Q4 2016 recorded only 25.8 million units. But, this sharp decline in smartphone shipments didn’t affect the overall growth in 2016, as there was a 5.2% marginal increase comparing to 2015. On the other side, the feature phone market is still dominating the overall shipments, and it is recorded as 136.1 million units. As per the report, for the first time, no Indian smartphone vendor is in the top 5 list of smartphone shipments and is entirely occupied by Chinese suppliers. The Chinese smartphone vendor market share for Q4 2016 in India is around 46% while the Indian smartphone vendors filled only 19%. The main reason could be the launch of budget-end smartphones with high-end specifications. This tactic has been introduced by Chinese mobile vendors, and has been recorded as the successful mantra! 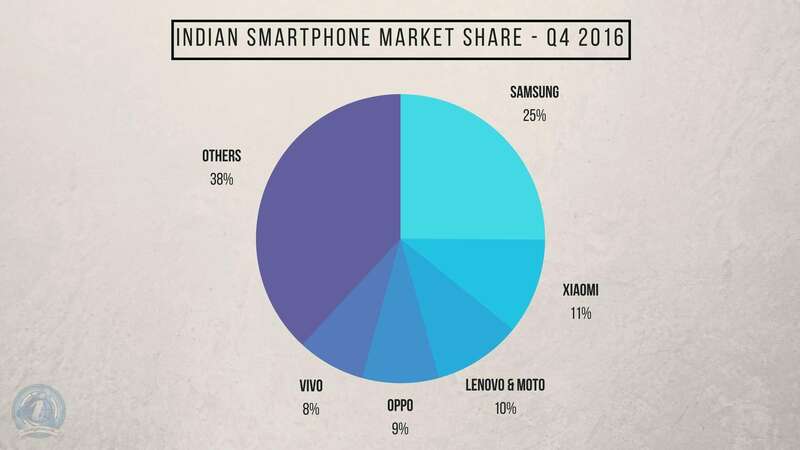 Have a look at the table -1 for better understanding on how Chinese brands completely dominate the smartphone market share in India. There were times when Indian mobile vendors used to dominate the smartphone shipments, but now, not even one mobile brand from India is on the top 5 list of smartphone vendors. Out of all the Indian mobile brands, Micromax used to have a significant role in the smartphone shipments with their subsidiary brand ‘Yu,’ but from the past 6 months, there wasn’t any new smartphone from the brand. Their old Canvas series sales have gone down due to the competitor smartphones. Now, let’s have a look at each brand and see the reason behind their success. The Apple of China has completed two years in the Indian market, and the brand never stopped dominating the Indian mobile market. Last year, Redmi Note 3 was one of the best selling smartphones from the company, and the introduction of budget-end Redmi 3s & Redmi 3s Prime has made the company to occupy the prestigious 2nd position. Lenovo alone can’t win the race, and the sales rose because of Motorola ‘G’ & ‘E’ series smartphones. Though Lenovo ‘K’ series has contributed to significant growth, it was Moto E4 which dominated the budget-end smartphone segment. It alone contributed a significant share of the smartphone shipments from the Lenovo. Oppo has recorded an annual growth of whopping 2000%, and this is mainly due to aggressive marketing both online & offline. Every retail store has a banner of Oppo, and this made every user check their smartphones. The selfie series is an asset to the brand which dominated the smartphone shipments in Q4 2016. The 5th position is supposed to be Reliance Jio but was dethroned by the Chinese brand Vivo. Just like Oppo, the main reason for the increase in smartphone shipments is offline presence & aggressive marketing. Recently, the brand launched 2 new smartphones which were Flipkart exclusive, and this is showing that the brand has started concentrating on Online too. Where are Indian Mobile Brands? As already said, Only Micromax has been there in the top 5 list for many years, and now it is nowhere! Rumor is that the brand is coming with a new flagship featuring a dual rear camera, but I believe it may not help the company to increase their shipments. The other brands like Intex, Lava, Karbonn were stuck to feature phone segments as they lost their top positions long back. These Indian brands were surviving only because of feature phone shipments. Still, most of the Indian users were not able to buy the smartphones as they are over-priced [> 10K] and the specifications offered by sub-5K range were not up to the mark. But the transition is happening, and it is very slow comparing to previous years, but this year there’ll be a significant increase as these Chinese brands have already planned to launch feature-rich smartphones in Q1 2017. It may help the transition happen very fast. Well, there are no words on whether other Indian brands are coming up with new smartphones. Also, the Digital India, & Made In India concept were quickly adopted by the Chinese brands. Even, Apple is establishing a manufacturing unit in Bangalore, India which can further reduce the cost of an iPhone. All these leading to the foreign dominance, and the downfall of Indian mobile brands. Not just in smartphone market share, foreign brands dominate even the feature phone segment. The recently entered Transsion group from China is the 2nd place for their ‘Itel’ mobile brand. Intex, Lava & Micromax were in the next positions with low feature phone shipments in Q4 2016. Let’s have a look at the table -2 for a better understanding of feature phone segment growth in Q4 2016. Sooner, we can expect the complete dominance by Chinese brands in the feature phone segment too. As already confirmed by the Transsion brand, it is hoping to release several new feature phones in the first quarter of 2017. It may have a huge impact on Indian mobile brands, as users have already started liking the ‘Itel’ mobiles. Well, this year marks the complete downfall of Indian mobile brands, and there’s no doubt about it. Share your opinion in the comment section if you accept this! Next articleCan Indian Mobile Phone Makers Ever Be In The Top Position in terms of Market Share & Sales?